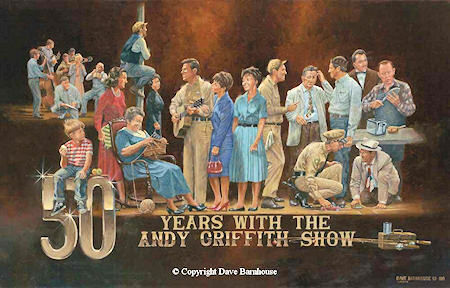 Welcome to our fourth eBullet for 2010, the 50th Anniversary Year for "The Andy Griffith Show"! Celebrations of next month's milestone anniversary are really getting revved up now. Several more 50th Anniversary products have just come out (see the Merchandise section below), and more are on the way. It's looking more and more like Oct. 3 is going to be not the culmination, but instead the kick-off for many more months of celebration of the 50th Anniversary! (No complaints here!) We'll get to all the 50th Anniversary news in a moment, but first we have a more somber commemoration. 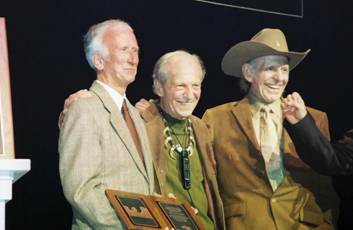 Mitch with Dean Webb (left) and Doug Dillard (right) at last October's IBMA Hall of Fame induction of The Original Dillards in Nashville. Amid our anticipation about the 50th Anniversary, Mayberry and the world lost one of the all-time greats when Mitch Jayne died this summer. Mitch was the pipe-puffing bass player in Mayberry's Darling family and he was the storytelling voice of The Dillards. He was also so much more. Mitch was a person who was beloved by all. He's also one of those people who, even after they have passed, leave you still feeling their presence. Not in the way of a Hiram, the fiddling ghost in Mitch's awarding-winning Fiddler's Ghost novel, but simply in the way that his love of life and adventure, the embroidery of his velvety storytelling, and his wry laugh stay with you. Mitch lived life to the absolute fullest. He savored every moment in a total embrace. When the time came for him to leave us, he did so with tremendous grace and humor and peace, just as he had lived. Author, musician and humorist Mitch Jayne, 82, died Monday, Aug. 2, 2010, in Columbia. Jayne was the author of five books, a weekly newspaper column published in the rural Ozarks for 20 years, and more than a dozen bluegrass songs recorded by The Dillards. He hosted a radio show in Salem that attracted national attention for its satire, including the "Snake and Tick Market Report," a regular feature that reported market prices for Hoo-Boy White Dot Crushproof Dry Valley Wonder Ticks and black, copperhead, coachwhip, garter and rattle snakes. A memorial service is planned for the fall in the Ozarks, the time and place Jayne loved best and never tired of sharing through his stories and music. Jayne was born July 5, 1928, in Hammond, Ind., the son of Bea and Gus Jayne. After a stint at the University of Missouri, he began teaching in one-room schools in Dent County, where he documented the use of the forgotten words and phrases of Elizabethan English spoken by his pupils. He once asked a 6-year-old what his father did for a living. "He principally farms," the youngster told him, "and when he isn't farming, he sits on the porch and plays the fiddle, just to beguile the time." One day when a student learned he wanted to see a beaver in the wild, the student told him, "Mr. Jayne, there's a beaver a workin' forenent the mill." When Jayne asked a student to stay after school for some chore, the boy replied, "No, Mr. Jayne, I'd best haste home. Mother don't sanction us being dilatory." Jayne published his recollections of his students' use of Elizabethan English in 2000 in Home Grown Stories & Home Fried Lies, illustrated by his wife, artist Diana Jayne. He lamented the consolidation of one-room schools, comparing it to the influence of TV and radio that brought homogeneity to language and culture, ultimately leading to the demise of the rich old English phrases in their last sanctuary in the remote Ozarks mountains. In 1962, Jayne befriended talented bluegrass musicians Douglas and Rodney Dillard, who invited him along to seek their musical fortunes in California. Jayne learned to play the bass lying down in the back of their station wagon en route to the West Coast. They played several venues, including the hungry i in San Francisco, where they caught the attention of critics for their hard-driving melding of electrified bluegrass and rock. They were invited to play on "The Andy Griffith Show," where they appeared regularly as the Darling Family for three years. Jayne authored many of The Dillards' best-known works, including "Dooley," "The Old Home Place" and "The Whole World Round." The group recorded more than 20 albums from 1963 to 2006, but Jayne's participation in the group waned in the late 1970s. While in California, Jayne also published his first books, The Forest in the Wind in 1966, and Old Fish Hawk in 1973. Old Fish Hawk, about an Osage Indian, was made into a movie starring Will Sampson in 1979. Jayne returned to Missouri around 1974 and built a house adjacent to the Marcoot region of the Mark Twain National Forest. One week before Christmas in 1981, a spark from the massive stone chimney of his house caught the handmade shakes of the roof on fire and destroyed his home. Two weeks later, his bluegrass friends held a benefit concert to raise money to rebuild the house, which he moved into in 1983. His popular radio show, "Hickory Holler Time," broadcast on KSMO in Salem, featured local news, bluegrass music, "The Snake and Tick Market Report," and a variety of satirical sketches, including a July Fourth episode in which Thomas Jefferson and George Washington trade foxhounds. He invented a character, Zeke Reeferzottum, who shared folklore such as predicting the severity of winter by looking at "wooly caterpillows. Not their color, their size! I been skinnin' 'em and tannin' their hides!" "Mother Mitch's News" was a spin-off of the "Mother Earth News," providing practical advice for living off the land, including making your own toilet paper ("perforations can be added with a spur or pizza cutter") or a sturdy truss out of old shoe tongues and Band-aids. The radio show-especially "The Snake and Tick Market Report"-had a wide following. A pilot once told Jayne he diverted his plane to fly over Salem so he could entertain passengers as they passed through his air space. Jayne started a third novel, the yet-to-be-published Glory Hole War, a story about Ozarkian saboteurs who take exception to a government plan to dam their spring. He also began writing his weekly column, "Driftwood," which appeared in several Missouri newspapers and magazines, and went on the lecture circuit to talk about conservation, not just of natural resources, but of culture and history. In his last decade, he received the official praise that in earlier years might have been the object of his gentle jokes. In 2002, The Dillards reunited to play to a packed audience in Carnegie Hall. In 2009, they were inducted into the Bluegrass Hall of Fame at the Grand Ole Opry. The publication of his fourth novel, Fiddler's Ghost, in 2007 led to the 2008 Governor's Humanities Book Award, and it was named one of the 10 best books of the year by the St. Louis Post-Dispatch. In addition to his wife of 16 years, Diana Jayne, he is survived by a brother, Sears Jayne of Boston; and daughters Carole Jayne of Eminence, and Valerie Jayne of St. Charles. Family and close friends were with him during his final days of compassionate care at Truman Memorial Veterans' Hospital, where he entertained and told stories until he was too weak to talk. When asked by a friend how he was doing, he replied, "I don't know. I've never died before." We've put several links to other remembrances of Mitch in the Memorials section dedicated to him on the front page at www.iMayberry.com. We also have created an album of photos of Mitch on TAGSRWC's Facebook page at this link Mitch Jayne Photo Album. TAGSRWC is making a donation in Mitch's memory to the Surry Arts Council and its efforts with the annual Mayberry Days festival. 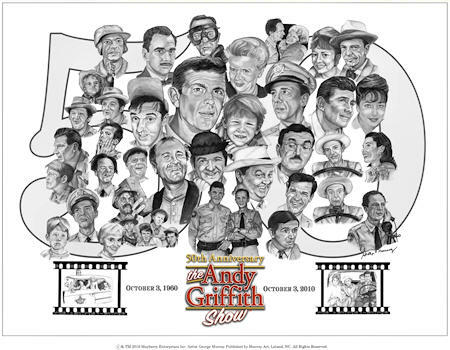 * Now-Sept. 24: TV Land is currently counting down the days leading up to the golden anniversary of "The Andy Griffith Show" with "50 Days of Andy," Monday through Friday from 3:00 p.m. to 6:00 p.m. ET/PT. Each day during this block, TV Land is sharing fun show facts and showcasing special episodes selected by celebrities and super-Goober "Andy Griffith" fans. From now through September 22nd viewers can log on to www.tvland.com/andy to vote for their all-time favorite episodes. The final results of the voting will air on Sat., Sept. 25th, from 8:00 a.m. to 9:00 p.m. ET/PT and Sunday, Sept. 26th, from 8:00 a.m. to 8:30 p.m. ET/PT during a 50th Anniversary top 50 countdown. TVLand.com/andy also includes nostalgic photo galleries, bios, trivia and games for TAGS fans of all ages. 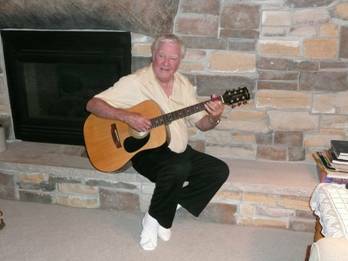 * Sept. 10 & 11: Tom Johnson RV revs up with David Browning in Marion, N.C.
* Sept. 11: James Best performs his one-man show at 7:30 p.m. at the H.J. Ricks Centre for the Arts, in Greenfield, Ind. He will show film clips as he leads the audience through his experiences in Hollywood and beyond. Tickets to the show are $15 per person. Seating at the one-night only performance is limited, so get your tickets today at Eventbrite at http://roscovisitsgreenfield.eventbrite.com/ or by taking a check to the Hancock County Visitors Bureau. * Sept. 16: Rodney Dillard and The Dillard Band perform at the Boom Days festival in Fort Payne, Ala. For more info, visit boomdays.org. * Sept. 21: Betty Lynn greets fans at the Andy Griffith Museum in Mount Airy, N.C., from 12:30 to 5:00 p.m. Autographs are $10 each and include an 8x10 photo. * Sept. 23-26: 20th Anniversary Edition of Mayberry Days in Mount Airy, N.C. This is the big one! Guests include: Betty Lynn (Thelma Lou), Doug Dillard (the banjo-playing Darling boy), Maggie Peterson (Charlene Darling), Elinor Donahue (Ellie Walker), James Best (Jim Lindsey), Ronnie Schell (two TAGS episodes and Duke Slater on "Gomer Pyle, U.S.M.C. "; his Mayberry Days debut! ), Jackie Joseph ("Sweet Romeena"), LeRoy McNees (one of the Country Boys in "Mayberry on Record"), George Spence (Frank the Fiancé in "Guest in the House"), Margaret Kerry (Bess Muggins and Helen Scobey; her first time at Mayberry Days! ), David Morris (son of Howard Morris), Laura Hagen (widow of Earle Hagen), and Karen Knotts (daughter of Don Knotts). Other festival favorites include a lecture by Neal Brower and concerts by The Doug Dillard Band (featuring Ginger Boatwright, Roger Rasnake, Buddy Griffin and Jim Vipperman) and by the VW Boys, the Rafe Hollister Band (no kidding!) and others. Some highlights to look for include Karen Knotts singing a brand new song about somebody close to her that we all love; a screening of "The Pickle Story" with commentary by Robert Dean, who worked as an extra in the episode; the Mayberry Days Trivia Contest; the North Carolina State Barbecue Championship; and Colonel Tim's Talent Time. And look for author Joey Fann and licensed Mayberry artists George Murray and Dave Barnhouse onsite with their works in and around the Andy Griffith Playhouse and Andy Griffith Museum. Full details, updates and tickets to those portions of the weekend that require a ticket are available online at www.surryarts.org. * Sept. 25: Release party for Rodney Dillard's I Wish Life Was Like Mayberry CD in Mount Airy, N.C.
* Oct. 1: Christ Lutheran Church in Rochester, Minn., hosts an evening titled "Mayberry Reflections." Ken Anderson, author of the book "Mayberry Reflections: The Early Years," will talk about his connection to Mayberry and about the ideals and values that Mayberry continues to instill upon its viewers. "The New Housekeeper" will be shown. Authentic Mayberry desserts will be served. Free childcare will be provided. Christ Lutheran Church is located at the corner of 20th Street and Marion Road, S.E. Call 507-289-0271 for more info. A free-will offering will be taken. * Oct. 2: Long Branch Baptist Church in Autryville, N.C., will celebrate the 50th Anniversary of TAGS with a day of music, memories, and down-home fun. Scheduled to appear: Rodney Dillard and The Dillard Band, Maggie Peterson, David "Mayberry Deputy" Browning, Jeff "Howard Sprague" Branch and Allan "Floyd" Newsome. The day will feature two shows by the performers listed above as well as a meet-and-greet lunch. There will also be a pickle-making contest, a whistling contest, trivia contests, and other activities throughout the day. There may be a Facebook page and Web site up in the coming weeks. Autryville is located approximately 60 miles south of Raleigh, 15 miles east of Fayetteville/Ft. Bragg and 80 miles northwest from Wilmington. Betty Lynn signing photos in the Andy Griffith Museum, amid some iconic Mayberry items. (Yes that is a salt-and-pepper suit worn by Don Knotts.) Photo by Hobart M. Jones. * Oct. 3: Betty Lynn greets fans at the Andy Griffith Museum in Mount Airy, N.C., from 2:00 to 4:00 p.m. Autographs are $10 each and include an 8x10 photo. * Oct. 3: TV Land celebrates the 50th Anniversary of TAGS with a special marathon of landmark episodes beginning at 4:00 p.m. ET/PT. * Oct. 7: Andy Griffith is among the second group of inductees into the North Carolina Music Hall of Fame in Kannapolis, N.C. (He won't be attending the ceremony.) For more info, visit www.northcarolinamusichalloffame.org. 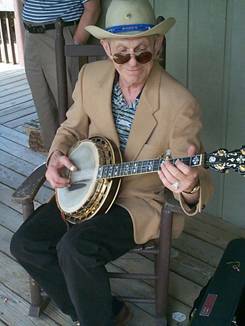 * Oct.19: Doug Dillard is the featured Master Artist at the Annual Bluegrass Concert at Glenville State College in Glenville, W.V. Doug will be interviewed about his career and then do a concert with the college's highly respected bluegrass band led by Buddy Griffin. To add some extra Mayberry flavor to the evening, David Browning, a local Ernest T. Bass and a Mayberry squad car replica will be part of the evening. The show starts at 7 p.m. Advance tickets are on sale at the college at (304) 462-6340 for $10. If any tickets remain, they'll be available at the door for $15. Andy Griffith dodged most of the force of Hurricane Earl last week. He also got lots of attention and weathered some partisan controversies about his recent public service TV commercial for Medicare. 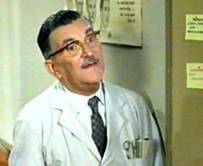 In case you've missed it, here's a link: AndyGriffithMedicarePSA. And, the North Carolina Music Hall of Fame will induct Andy on October 7. Ron Howard's next film as director is The Dilemma, which stars Vince Vaughn, Jennifer Connelly and Winona Ryder. It'll be in theaters in January. 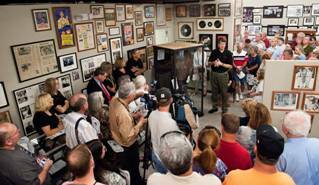 An overflow crowd gathered at the Andy Griffith Museum for the unveiling of the suit donated by George Lindsey to Emmett Forrest’s Andy Griffith Collection. Photo by Hobart M. Jones. 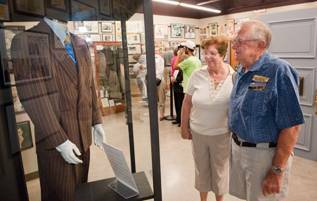 Margaret and Sparky Sparkman of Walkerton, N.C., admire George Lindsey’s suit following the unveiling. Sparky is also blocking our view of the original Sheriff sign from the courthouse door on TAGS. (Attaboy, Sparky!) Photo by Hobart M. Jones. At the Taylor Home Inn, James Best recreates a Mayberry scene from “The Guitar Player Returns.” Jim Lindsey may have had a spiffy “set of threads” back in the day, but it appears the Mid-Mountain Finance Company may finally have repo’d his shoes! George Lindsey got an incredible amount of media coverage in the last few weeks. Or at least a suit he wore on TAGS and others shows did. 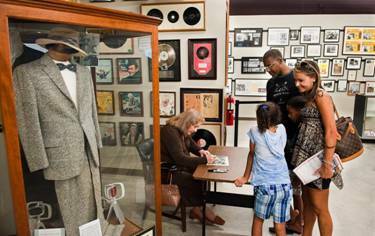 George donated a brown striped suit he wore as Goober to the Andy Griffith Museum in Mount Airy. George was unable to attend the unveiling on Aug. 27th in person, but he did offer this comment: "It's an honor for me both to have my stuff on display and also that people want to see it. Of course, this ‘stuff' was on TV a long time-and still is. Generations of TV watchers continue to love Mayberry and all of its characters. I'm proud to have portrayed one of those characters. The love is mutual." Mount Airy residents Betty Lynn and Emmett Forrest, Andy Griffith's lifelong friend whose collection makes up most of the museum's exhibits, were on hand for the unveiling and to welcome a capacity crowd. The suit's unveiling made the front pages of at least two newspapers and also received prominent coverage in dozens of other newspapers across the country, including the Los Angeles Times and Kansas City Star, as well TV stories. It was big! 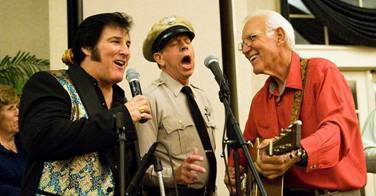 Doug Dillard is rearing to go for his 21st consecutive appearance at Mayberry Days in September. (That would be every year of the event!) Keep up with Doug at www.dougdillard.net and www.hillbillyhollywood.com. 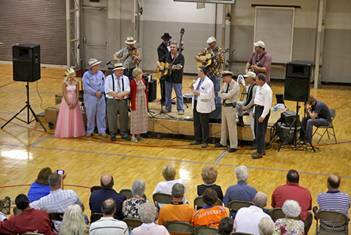 Dean Webb is in the middle of another season performing with the Missouri Boatride Bluegrass Band. Most of their dates are near the band's home base in Missouri. You can see their complete schedule at www.missouriboatride.com. James Best has had a busy summer (and soon fall) performing, making personal appearances and promoting his Best in Hollywood memoirs. Here's a photo from his recent visit to the Taylor Home Inn Bed & Breakfast in Clear Lake, Wis. The Taylor Home Inn is a really amazing place, especially for Mayberry fans. 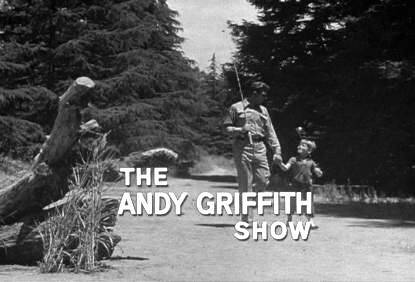 And what's more...it's an officially licensed "Andy Griffith Show" property! And here's one more Cast & Crew link, this one from near the Pebble Beach Links. It's a nice newspaper article from August about TAGS director Peter Baldwin, one of the great talents behind the camera: PeterBaldwinmontereyherald. Singin' "Eating Goober Peas" with Ernest T. Fillmore, Ind. "Gas It Up, Chickie" Richmond, Ky.
"That Haircut of Yours May Be City-Style, but Your Heart Was Shaped in a Bowl" Cuba, Ill.
We now have had 1,359 chapters founded since TAGSRWC started 31 years ago. We also currently have one chapter (that we know of) pending as they try to decide on a name in Taft, Calif. 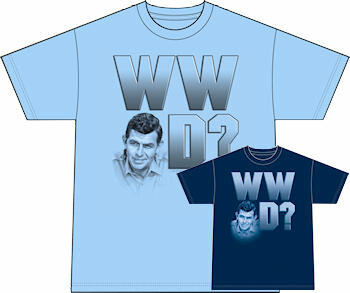 Bunches of newly licensed "Andy Griffith Show" items continue to hit our Weaver's Dept. Store shelves this year. Most of the new products are tying into this year's 50th Anniversary celebration of TAGS. Here's a sampling, including the very latest items. 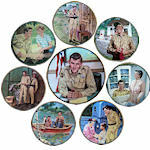 You'll find these and much more in the weaversdepartmentstore.com section of iMayberry.com. The Edition is limited to a total of 5,900 pieces, all signed and numbered by the artist. We expect them to sell out very quickly. Note: Other items ordered with this print may ship separately, but they will be billed together. And there will be just our single shipping charge of $5.00 per shipping address, no matter how many items or shipments are going to that same address to fill the order. Available to order now. Shipping begins in late September. This CD is brand new in September 2010 and features Rodney Dillard singing lots of favorite Darlings tunes from "The Andy Griffith Show," along other classic Dillards tunes and some later songs about the Darlings. Some classic bluegrass and Mayberry songs for any fan of, well, bluegrass and Mayberry! Note: In most cases, other items in the same order as this CD will ship with this CD once it's available for shipping in late September. * We continue to stock three books, audio cassettes and an audio book (on four cassettes) by late Dillards storyteller and writer Mitch Jayne. You can find them in the Dillards section at Weaver's. What a blessing it is for us still to be able to hear his voice and read his words--not to mention all the great music and memories he has left us! * Two Mayberry books have come out with new editions in time for the 50th Anniversary. First, Joey Fann has added a touching new Introduction (and a new cover) to his The Way Back to Mayberry: Lessons From a Simpler Time book, based on the Mayberry Bible Study Class that he created. The price is still the same ($12.99). 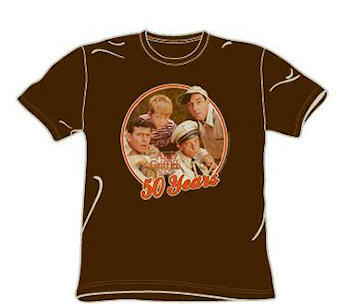 Whether you're looking for a Mayberry T-shirt, something Mayberry for your car, decorative wooden building fronts, Mayberry-related comedy and music CDs, all variety of books and cookbooks, and even Barney Fife light switch covers and a thermometer (get ready for those winter temperatures! 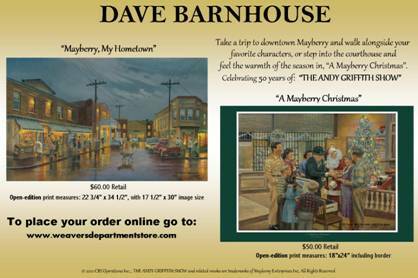 ), we've got most things Mayberry online at Weaver's at iMayberry.com. Drop by and have fun looking around. We also have added a lot of vintage, unique and rare items to our online Weaver's Dept. Store at iMayberry.com this year. You'll find them throughout the site, but the greatest concentration is in the Collectibles & Special Items section. Most of these items are designated as fundraisers for Haiti Earthquake Relief, Flood Relief, the George Lindsey/UNA Film Festival, Mayberry Days and other charitable efforts. And there's just one or two of most of these items, so check them out while they're still available. 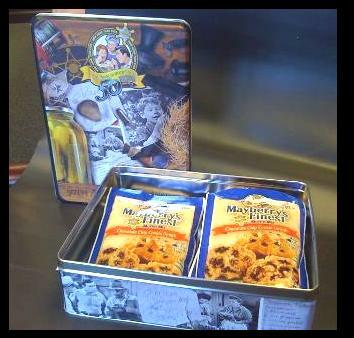 * Mayberry's Finest Brand Foods, the official food licensee of "The Andy Griffith Show," is celebrating 50 years of Mayberry with the issue of a Special 50th Anniversary Edition lithographed gift tin. * One last product note: We probably won't be stocking this item at Weaver's, but Hallmark has an official 50th Anniversary TAGS Christmas ornament this fall. You can find it at Hallmark locations. It's similar to the TV set ornament that plays the TAGS theme that Carlton produced a couple of years ago. Please call this number only for ordering or for inquiring about orders placed by phone. All inquiries about online orders should be made online by writing weavershop@aol.com. Mick traveled with his meticulously refurbished 1963 Mayberry squad car replica and his fascinating Mobile Mayberry Museum, which also served as the hauler for his squad car. Just how meticulous was his squad car maintained? Well, last October it sold at auction for $121,000. Nuff said. Mick was a virtuoso computer chip designer, ran a family-owned specialty advertising business, played banjo and guitar (and who knows what all), and was a nationally recognized expert and enthusiast for hot-rod automobiles. He was active in all kinds of fundraisers for charities, but was perhaps best known for his annual Barney's Day Out in the Twin Cities. Mick overcame serious health problems since childhood. He easily could have settled for less out of life, and no one would have thought less of him for it. But he blessed the world and all who knew him with constant cheerfulness and infectious joy. He was indeed a wonderful member of the greater Mayberry family and is greatly missed. Kieffer, Michael J. Sr. ‘Mick,' Age 63, of St. Paul. Beloved Husband, Father and Grandfather passed away on August 23, 2010, following a lengthy battle with lung disease. Survived by loving wife of 43 years, Kathy; children, Michael Jr. (Sue), Patrick (Debbie), and Laura (Bryan) Rodriguez; grandson, Austin; brothers, David (Sharon), Chuck (Sandra), Earl Jr. (Patty); numerous nieces, nephews, other relatives and friends. After retiring from a career in electrical engineering, Mick enjoyed making children and adults laugh by impersonating Barney Fife, locally and across the country. A Gathering of Family and Friends, and Celebration of Mick's Life, was held on Saturday, Sept. 4, 2010. TAGSRWC is making a donation to the Surry Arts Council and Mayberry Days in Mick's memory. Our thoughts and prayers are with his family. 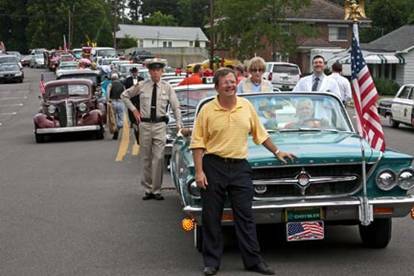 Graysville Mayor and Mayberry Minutemen chapter leader Doug Brewer prepares to unleash the opening parade for the Mayberry Comes to Graysville festival/Mayberry Squad Car Nationals. Perched in the car is Maggie Peterson, flanked by David “Mayberry Deputy” Browning and Allan “Floyd” Newsome. Photo by Alan Thornton. 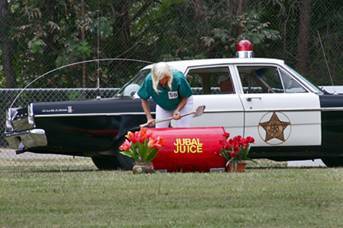 “POW-POW-POW!”—With husband Neil behind the wheel, Pat Coleman of Remembering Mayberry chapter (Chillicothe, Ohio) smashes Jubal Foster’s still as part of the obstacle course race. At each stop on the course, Pat slowly morphed from a costume as Convict-at-Large Naomi into the wardrobe of Mount Pilot Fun Girl Daphne (she’s about half-way done here). 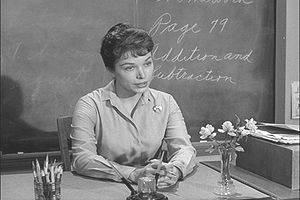 It was her homage to Jean Carson, who played both parts on TAGS. Photo by Alan Thornton. The finale of the evening band concert at the Mayberry Day in Graysville. Rodney Dillard and The Dillard Band are onstage with a little help from Jeff “Howard Sprague” Branch on bass. Standing (l-r) are Potato Queen Sara Babb, Bob “Briscoe” Mundy, ringleader Kenneth “Otis” Junkin, Maggie Peterson, Allan “Floyd” Newsome, David “Mayberry Deputy” Browning, Phil “Ernest T.” Fox and Tim “Goober” Pettigrew. Photo by Alan Thornton. REMOTE FANS—Members of one of our newest and most far-flung chapters, Big Barn at the Bruin Lounge (Katmai National Park, Alaska,) show off their new chapter charter (and a shiny photo of Big Barn). 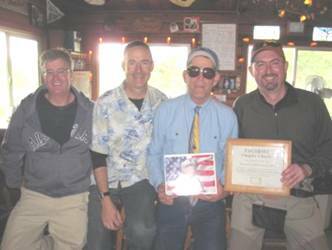 Pictured (l-r): Kevin Miller and Jeff Gard (both of Boulder, Colo.) and year-round Katmai locals Jim Albert (in the Old Sam-shaped tie) and Jason Hughes. This year's Nationals was considered by many attendees to be one of the best yet. Cars and fans turned out from at least eight states. Nice weather, good-sized crowds, stars Maggie Peterson and Rodney Dillard, and a record 11 Mayberry squad cars all contributed to the fun. Add a slew of Mayberry tribute artists, good food, trivia, music and other entertainment, and it was an all-around great day-and evening. For the record, the Overall Winner for the 2010 MSCN was the car owned by Tommy "The Hammer" Hammock of Springville, Ala. The team's car also finished first in the Obstacle Course Race. The winner for Best Appearance (as voted by all the car owners) was the car owned by Don and Joyce Kernan (aka Mr. and Mrs. Schwamp) of Foley's Market chapter (La Salle, Ill.). "Hearty Eatin' Men and Beautiful, Delicate Women" (Tuscaloosa, Ala.) is the organizing chapter for the MSCN each year. The group also participated with one of their Mayberry squad car replicas in Hot Rod Magazine's 10-state 2010 Power Tour of classic cars in June. Their picture is even in the October issue of the magazine (page 62). And last, we have a report from the August meeting/cookout of "Shakedown! Shakedown!" chapter (Laurinburg, N.C.). Leader Dewey Lamb says, "We had 25 in attendance. We added a Mayberry touch to our dessert selection. We churned our own ice cream. The smaller kids were totally mesmerized by these contraptions. "We have three members who drive a hundred miles to each quarterly meeting. Everyone had a terrific time. We now have to start planning for our Christmas chapter meeting. Lotta work, but the sight of smiling faces makes it worthwhile." He adds, "A few of our members are also looking forward to being in Mount Airy for Mayberry Days. Our chapter has been recruited to run the pie-eating contest." The chapter is also very involved in our "Who's Been Messin' Up the Bulletin Board?" chapter's silent auction at Mayberry Days, which raises money for the Surry Arts Council. And the chapter helped out with the charity auction for DARE at the Mayberry event in Troy, N.C., in August. Nineteen chapter members attended that event. And don't think we let the chapter get away with not giving us more details about the ice cream served at their August meeting. Using our intense interrogation methods, we were able to wheedle out of them that they cranked one churn of vanilla and one churn of strawberry. And they had chocolate syrup and blueberries for toppings. And, well, that's the scoop from some of our chapters for now. Some of the most energized daily and weekly Mayberry activity is on the Web. For nearly two years now, www.iMayberry.com/podcasts has been the home of the wonderful Two Chairs, No Waiting Internet Radio Show (a podcast) hosted by TAGSRWC's own Allan Newsome. Two Chairs, No Waiting has TAGS news, interviews and pretty much whatever happens to be going on in and around Mayberry. Each one lasts between 10 and 20 minutes. There's a new episode every Tuesday and also an Archives in case you want to listen to episodes you've missed. So pull up a chair, grab a bottle of pop and enjoy the fun of listening to what is basically Radio Free Mayberry wherever you and your ears happen to be! An d did you know...TAGSRWC has a page on Facebook? It's www.facebook.com/tagsrwc. We started the page less than a year ago and have been averaging about 100 new friends a week. We hope you'll check out our Facebook page and be a part of helping it grow and spreading the word about Mayberry news and activities. Lots of folks enjoy just trading favorite lines or memories from the show. And it's a great place to find rare photos (we're adding more as often as we can) and interesting links. It's frequently where news about Mayberry first breaks. We invite you to share whatever's on your mind about Mayberry, and see what others are saying. Well, as you can see, Miss Crump isn't happy with us, because there's no trivia quiz again for this issue. There's so much news going on in advance of Mayberry Days and the 50th Anniversary that, to paraphrase Barney, "We don't have time to stand around here and discuss trivial trivialities." Between issues of The eBullet, keep up with the goings-on in Mayberry with the daily "Who's Been Messin' Up the Bulletin Board?" (aka WBMUTBB) Digest. It's a free subscriber list that consists entirely of comments, newsflashes, and questions and answers from subscribers. You can sign up for that list by going to the "Mailing Lists" link at tagsrwc.com. WBMUTBB also has its own password-protected Archives where you can follow the ongoing stream of messages. The next issue of The eBullet is scheduled for late October, with the next Weaver's Newsletter planned for late September or early October.